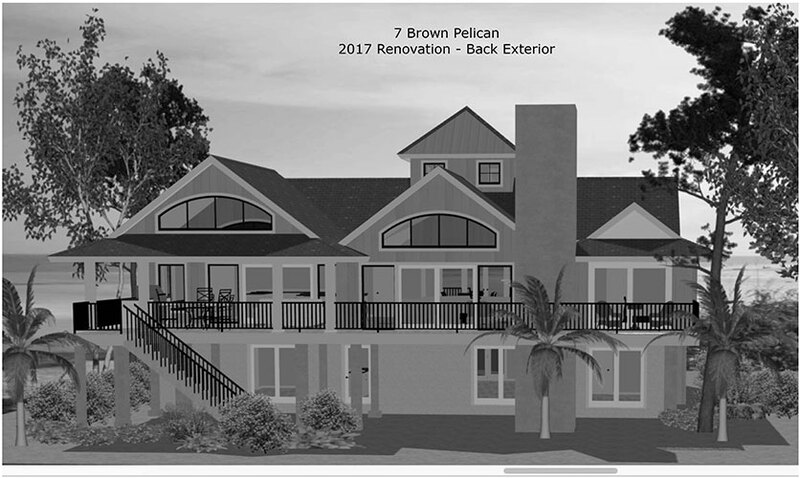 Fully renovated in 2017, 7 Brown Pelican offers 7 bedrooms, 6.5 baths, bedding for 18 guests, ocean views, covered and uncovered patio areas, private pool and spa and is located in the heart of South Beach and a short walk from the South Beach Marina. 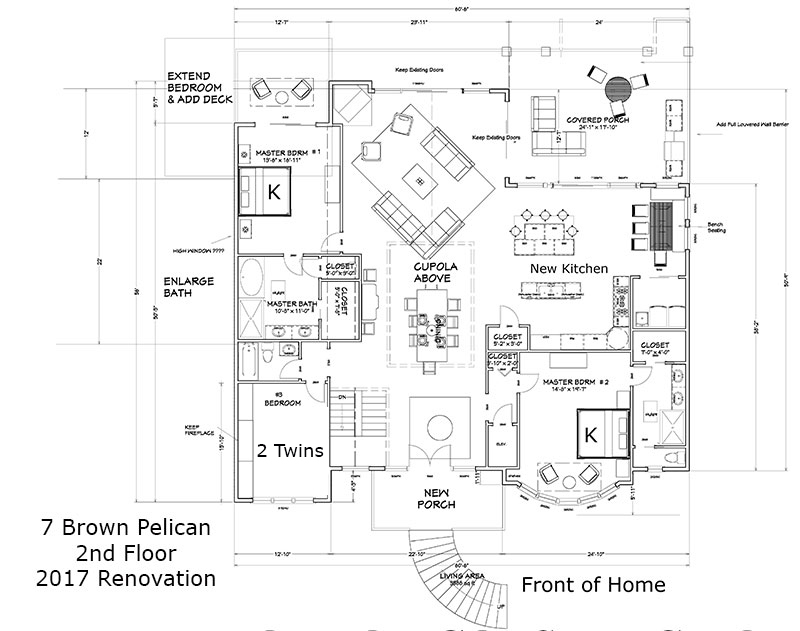 The main living room, kitchen and 2 master suites are located on the 2nd floor of the home. A primary element of the 2017 renovation included completely moving the kitchen and opening it up to the dining and living rooms. This open floorplan allows ocean views from all 3 of these common areas, and the kitchen now provides access to a new covered patio with sweeping views. The living room's high beamed ceilings will grab your attention and draw your eyes to the beautiful oceanfront views behind the home, and the comfortable furniture and large flat screen TV will provide hours of relaxation with family and friends. The master suite to the left of the living room features a king bed, flat screen TV, ocean views and en-suite bath. The second master suite on the right side of the home features a king bed, flat screen TV and private bath, and a third bedroom with 2 twin beds completes the 2nd floor and has a full bath with walk-in shower just outside the bedroom door. This bath can also be used by guests in the dining and living room and a full laundry room is also included on this level. A staircase takes you down to the 1st floor with casual living room, half bath and 4 guest bedrooms. The fully furnished living room features a flat screen TV, pool table, full bath with walk-in shower and access to the covered patio with dining table and chairs and gas grill. The bedrooms on the 1st floor are located in each corner surrounding the living room. One bedroom features a king bed, TV and ensuite bath. The second bedroom features two queen beds and full bath with walk-in shower. The third bedroom features two sets of bunk beds and a full bath with shower/tub combination, and the fourth bedroom features 2 twin beds. A full bath in the living room serves as the bathroom for the bedroom with 2 twin beds. 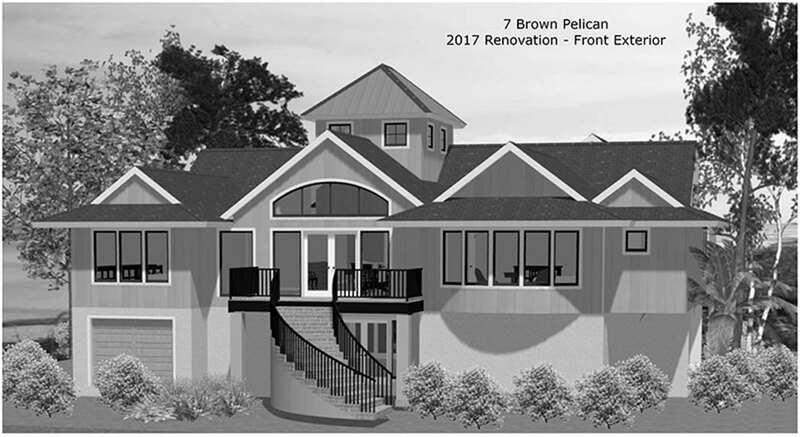 Amenities at 7 Brown Pelican are what make this home shine! The pool and spa surrounded by privacy landscaping, putting green in backyard, fully furnished covered patio with gas grill and 2nd floor porch with stunning views provide the perfect setting for entertaining and relaxing. Spa heat is included with your rental and the pool can be heated for an additional fee. Wireless internet is available at no cost to guests. Beach access begins with a defined path in front of the home which leads to a boardwalk and a walk through the sand. The Ocean and Sound come together at this location and the beach on this end of the island is an ideal spot for viewing dolphins at play and gorgeous sunsets. *Please note: Due to safety concerns, fireplaces are non-functioning on covered patio and inside the home. The location of 7 Brown Pelican in Sea Pines is unbeatable. The South Beach Marina Village is a short distance across the street and easily walkable, and a network of bike trails will take you from Brown Pelican to any location you desire within or outside Sea Pines Plantation. Sea Pines is a world-class vacation resort with pristine beaches, miles of biking trails, Lawton Stables with live petting zoo, public golf courses, including Harbour Town Golf Links, Racquet Clubs, shopping, restaurants and fully operational marinas in Harbour Town and South Beach with water sports, fishing charters and live entertainment. Most Sea Pines amenities are open to the public, but some may have parking fees or seasonal rates as determined by the resort. Staff was excellent to work with. We had a very large group with children of all ages and it was very useful to be able to get in a few hours early and depart closer to noon as there was no one leaving or arriving immediately when we left. The accommodations were superb for a large group. Our family visit over Thanksgiving week was wonderful. The home on the beach was perfect for our large group of 17. The heated pool and quick walk to the beach was perfect for all of us ranging from 11 to 75. Any small last minute request we had was taken care of by Destination Vacation, from extra cot rentals, to bedding to suggestions for drivers. You all were terrific and we look forward to coming back again. 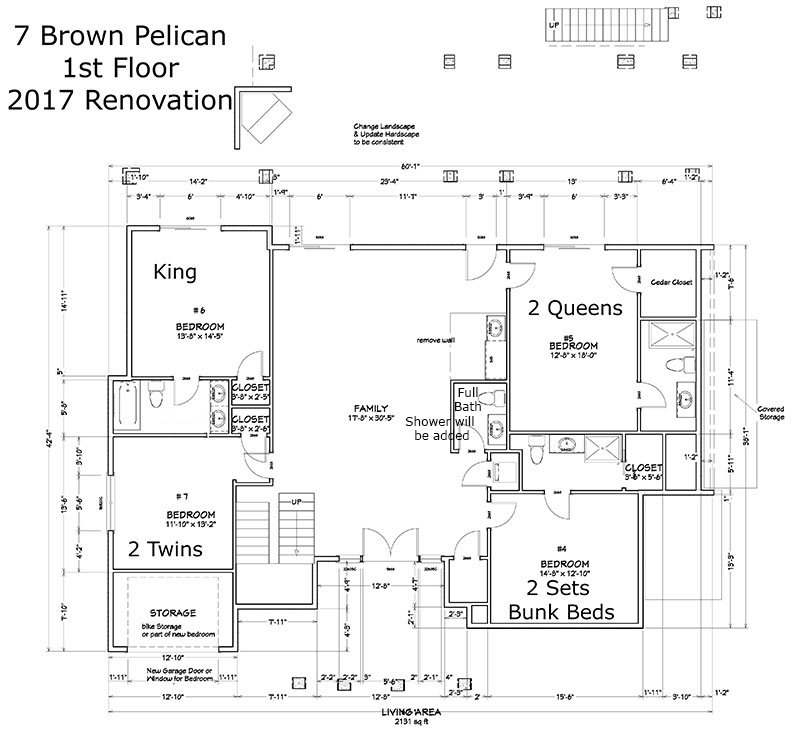 Our family enjoyed the house at 7 Brown Pelican with its terrific ocean view, lovely new kitchen, open plan, and sheltered porch. The walk to the beach was an easy one to make and the beach was quiet and often deserted. The bedrooms easily accommodated three generations of our family and having two living spaces was a great help for us. We have been coming to Hilton Head every few years since 1976 and thus experience was considered the best by our family.